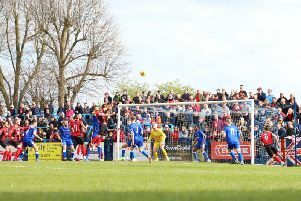 Marcus Law chose to keep his feet firmly on the ground after his Kettering Town team took a firm grip on the title race in the Evo-Stik League South Premier Division. For the second week in a row, the Poppies hit a dramatic stoppage-time winner as Lindon Meikle’s excellent strike secured a 3-2 success over Needham Market at Latimer Park. Aaron O’Connor had earlier scored twice, only for the visitors to hit back on both occasions before Meikle came up with the goods when the game seemed to be heading for a draw. And it proved to be a crucial goal as second-placed Stourbridge suffered a 1-0 defeat at Lowestoft Town which meant Kettering moved five points clear at the summit while still having two games in hand. The late drama resulted in many on social media to describe the title race as being “over”. But Law is having none of that and insists there is plenty of work for his team to do. And the Poppies manager felt the win was nothing more than the volunteers, who worked so hard to get the game on despite the freezing conditions, deserved. “If the league want to hand me the trophy now so that I can parade it in front of everyone then I would happily take it,” Law said. “But football doesn’t work that way. As proven in this game, at any given time if you’re not strong enough or good enough then you could be walking in frustrated with your result. “All we can do is concentrate on ourselves. If we do our job and make sure we are taking points then yes, it’s down to everyone else to chase us. “But nothing gets handed to you and anything that is easy and handed to you isn’t worth winning. “We are going to work right to the death. We are going to try to score goals and put points on the board. There is still a lot of work to do and a lot to focus on. “But we have to give a massive shoutout to the volunteers, the groundstaff and the board. “It would have been very easy to call the game off. That would have been the easy option. “But, generally, if you take the easy options you will never get the rewards that you are fighting for. This was the third time in the space of a month that Kettering have scored a stoppage-time winner having done so against AFC Rushden & Diamonds on New Year’s Day and in last weekend’s top-of-the-table clash at Stourbridge. And Law is pleased to see his team playing “until the end” as they bid for automatic promotion. He added: “We have got a lot of character, a lot of belief, especially on our own ground. We know we can keep going until the end. “We got pulled back twice and fair play to Needham Market, they made life difficult for us and they seized on the errors that we made, which is frustrating but that’s football, you’re not going to get it perfect all the time. “We have a cluster of players who can come up with something for us at any given time.